The Book Date : Heartbreak Cove. Lily Everett. 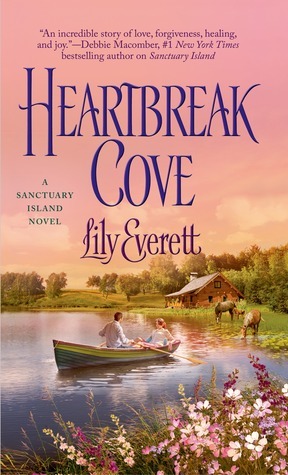 Heartbreak Cove is #3 in Lily Everett's Sanctuary Island series. It is another small town, contemporary romance, with enough points of difference to help it stand out from the myriad of books that follow this format. I quickly became engaged and thoroughly enjoyed it. Andi Shepard is the local sheriff, once a city cop, but now doing her policing in a place she loves. Just when things are going along nicely for Andi some surprises come her way that turn her world upside down. Caitlin arrives, insecure and untrusting of women especially. Andi will have her work cut out to gain her trust. Then Sam arrives back on the island and starts Andi off in a journey of self discovery and reformulating of what she believes. As well as that the local rich man Dabney Leeds is about to shake up Andi's hold on the sheriff badge. I really liked how Andi adapted to all these challenges and in spite of her family background comes through for herself, Caitlin and Sam. Sam arrives on the island with a highly strung horse that needs to be rescued from its abusive owner. Queenie takes up residence at Jo's stables and Caitlin falls in love with her, even though the two are no way ready for each other. Later added into this mix is another local horse that badly needs Sam's help and attention. Sam too has a really sad, tough background and he doesn't want this to anyway harm Andi or Caitlin. What he doesn't figure on is the love they have for him or the sense of pride and community on this island. Here they value horses, there are a group of wild horses protected on this island, so Sam's work is rated. Along with all this runs a smaller story of Taylor and Matt. Previously these two were found illegally hanging out in Heartbreak Cove - part of the wild horse sanctuary. They had been dealt with by Andi and Taylor especially has changed her wild teenage ways. She has some skills on computer, and is best friends with Matt who has a girlfriend. But Taylor wants more. My prediction of what would happen to the horses turned out to be correct. I found the ending satisfying, in a slightly Disney or Hallmark movie way. I did have questions about the way one of the townspeople turned at the end. Slightly all too cosy an ending. However I love a happy ending for everyone so I am not too upset by it. I will most certainly be looking forward to Home For Christmas later in the year - which tells the story of Caitlin's Dad. I am sure we'll see him before too much longer on Sanctuary Island. It's great that it stands out in the small town romance genre! I need to check out this series. There are so many small town series being written. I wasn't so fond of the first in this series but really liked this one.